4. INDEPENDENT NATIONAL ELECTORAL COMMISSION (INEC). 2. Set aside the Judgment and Rulings of the lower Court delivered on 2nd April 2019. 4. Invoke Section 25 of the Court of Appeal Act and grant all the Appellants' reliefs. In the notice of appeal filed in Abuja today 4th of April,the appellant affirmed that "being dissatisfied with the Ruling and Judgment of the High Court of the Federal Capital Territory sitting in Bwari, dated 2nd April, 2019, do hereby appeal against same to the Court of Appeal upon the grounds set out which will at the hearing of the appeal seek the reliefs set out. 1. "The cause of action arose on the 4th of August, 2018.
ii. The 1 st and 2nd Respondent filed their suit before the lower Court on the 4th of September, 2018. "Every pre-election matter should be filed not later than 14 days from the date of the occurrence of the action complained of in the suit. "The 1st and 2nd Respondents brought their suit before the lower court outside the mandatory 14 days. Precisely on the 44th Day! 2.The lower court erred in law by violation of the Appellant's right to fair hearing by its failure to give full consideration and determination of the case of the Appellant when it failed to consider the reply on points of law of the Appellant in support of the Notice of Preliminary objection filed on the 19th of September, 2018 when delivering its judgment. i. A Court of Law must give full and dispassionate consideration of all issues raised by parties before him. ii. A court of law is meant to be an unbiased umpire. iii. A Court of law must decide all issue brought before it for adjudication. 3.The lower court erred in law in violation of the Appellant's right to fair hearing by its failure to consider WAEC'S Affidavit of Compliance Order dated 11th Sptember,2018 and copy of RESULT LISTING referred to by the court order as the LEDGER containing the results of all the candidates (001-221)who sat for the Senior Secondary Certificate Examination filed before the lower court when it was delivering its judgment. ii. A Court of Law must give full and dispassionate consideration Of all issues raised by parties before it. iii. Failure of the lower court to consider the affidavit of compliance, statement of result and ledger of WAEC as directed by it occasioned a grave miscarriage of justice on the Appellant. LPELR-4754(CA). KUSAMOTU v. APC & ORS (2019) LPELR46802(SC), delivered on 15th February, 2019 amongst others, when it delivered its judgment. The above binding cases were cited to the lower Court. ii. Lower courts are bound by the decisions of appellate courts, applicable to cases before them even when the said lower courts do not agree with the decisions. iii. The lower Court neither considered nor applied the binding appellate courts' decisions on it before giving its judgment of 2nd April, 2019. 5.The lower Court erred in law when it failed to follow the findings of the Osun State High Court of Justice in Suit No: HOS/M.103/2018 and Suit No: HOS/M. 118/2018 in respect of the same subject matter. The lower court is bound to follow the decision of Osun State High Court in Suit No: HOS/M.103/2018 and Suit No: HOS/M.118/2018. The lower court cannot sit on appeal over the decision of Osun State High Court in Suit No:HOS/M.103/2018 and Suit No: HOS/M.118/2018. iii. The decision of the lower Court set on a collision cause the decision of two courts of coordinate jurisdiction. 6. The lower court erred in law when he held that the 1st and 2nd Respondents in this case are not affected by the definition of pre-election matter as defined in Section 285(14) (c) of the 1999 Constitution amended by the Constitution of the Federal Republic of Nigeria, 1999 (Fourth Alteration No.21) Act, 2017 to the case of Anthony Ifanyi & Anor. V. Alhaji Abubakar Atiku Bagudu & Ors delivered by this Honourable Court on 17th December, 2018 in Suit No. CA/A/698/2018. The 1st and 2nd Respondents in this case arte affected by the limitation period set for the filing and determination of pre-election matters. 7. The lower court erred in law when it assumed jurisdiction over a matter where the cause of action arose from the territorial jurisdiction of the High Court of Osun State. 1. The complaint of the 1st and 2nd Respondent is the emergence of the Appellant as the candidate of the 3rd Respondent at the Osun State Governorship Election held 22 nd September, 2018 Election and the Rerun Election of 27th September, 2018. 2. The 1st and 2nd Respondents are challenging the eligibility of the Appellant to contest as candidate of the 3rd Respondent in the Osun State Governorship Election held on the 22nd of September, 2018 and Re-run Election of 27th September, 2018. 3. The cause of action before the lower Court Suit arose in Osun State, and it is a clear indication that FCT High Court, Bwari, Abuja, where this Suit is instituted is outside the territorial or geographical jurisdiction where the cause of action arose. 4. The lower Court has no territorial jurisdiction to entertain the suit. 5. 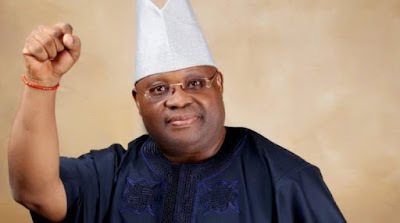 The cause of action has to do with the Governorship of Osun State which is distinct and outside the territorial jurisdiction of the Federal Capital Territory, Abuja. 8. The judgment is against the weight of evidence.